Verses 1-11 Judah leaves his brothers for awhile after they had sold Joseph to the Midianites (Ishmaelites). While he was gone, he found a Canaanite woman who he married. They had three sons, Er, Onan, and Shelah. Judah found a wife for Er and her name was Tamar. Er was a wicked man and the Lord killed him. Judah told his second son, Onan, to take Tamar for his wife so an heir could be raised up for Er, his brother. Onan knew that the heir would not be his, so when he went in to Tamar, he deliberately did not get her pregnant. He did not want to give an heir to his older brother. This displeased the Lord, so the Lord killed Onan also. Judah tells Tamar to stay in his household until his third son, Shelah, grows up. So she remains in Judah’s house. Verses 12-23 Now Judah’s wife dies. Judah leaves to go with the sheepshearers with his friends. Tamar finds out that he has left. Shelah has grown up, and Tamar has not been given to him for his wife. So Tamar takes off her widow’s clothing and dresses herself like a harlot. She then sits outside in an open place that is on the road to Timnah (where Judah had gone). Judah sees her, thinks she is a harlot and asks to be with her. She asks for what form of payment he’ll use. He agrees to give her a young goat, but she requires that he leave some things with her until he makes good on his promise. He leaves his signet and cord and his staff. The arrangement made, he goes in to her, and she becomes pregnant. After he’s gone, she puts back on her widow’s clothes and goes home. Judah tries to send the payment of the young goat to the woman, but he is unable to find her. The local people tell him that there is no harlot who works in the area where he is looking. So Judah says to just let her take the tokens he left with her as payment instead, since they can not find her. Verses 24-30 Three months later Judah is told that Tamar is pregnant and that she is accused of “playing the harlot”. Judah demands that she be brought out for punishment. When she is brought out, she tells them that the man who got her pregnant is the owner of these items, the signet and cord and the staff. Judah recognizes them as his own and realizes his fault in this matter. He had not dealt righteously with Tamar, because he should have given her to Shelah for his wife. Judah never goes in to her again. Later she gives birth to twins, named Perez (means “breach” or “breakthrough”) and Zerah (means “sunrise”). 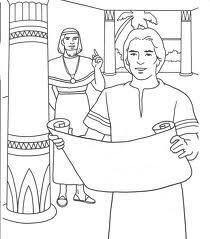 Verses 1-6 Joseph has been taken to Egypt and sold to Potiphar. The Lord was with Joseph and made him a successful man. Potiphar saw that the Lord was with Joseph so he put Joseph overseer over all the things in Potiphar’s house. The Lord blessed Potiphar’s house because of Joseph. Potiphar so trusted Joseph that he didn’t check on Joseph to keep tabs of all his wealth. He only knew of the food that he ate. Joseph is described as being handsome in form and appearance. Verses 7-18 Some time after all this, Potiphar’s wife sets her sights on Joseph and asks him to come into her bed. Joseph refuses. He acknowledges the honor is having all of Potiphar’s household under his own control. The only thing Potiphar has not given to Joseph is his wife. Joseph says, “How then can I do this great wickedness, and sin against God?” She continues to pester him day after day, but Joseph will not sleep with her. One day Joseph goes into the house to do his work, but none of the other men are inside. Potiphar’s wife grabs hold of his clothes and asks him again to sleep with her. Joseph runs away outside, leaving the clothing in her hands. Potiphar’s wife calls to men of her house and says that Joseph came in and tried to force himself upon her. She said that when she cried out loudly, he ran away leaving his clothes behind. Potiphar’s wife kept the garment until her husband came home, and then she told him the same false story. Verses 19-23 So Potiphar became very angry and had Joseph thrown into prison where the king threw his prisoners. But the Lord was with Joseph and gave him favor in the sight of the keeper of the prison. So the keeper of the prison gave Joseph the job of caring for all of the other prisoners. The keeper of the prison did not check into what Joseph did. The Lord was with Joseph and whatever he did, the Lord made it prosper.